Musings of a Palaeolinguist: Book Launch Tour: The Vesuvius Isotope, by Kristen Elise, Ph.D. This post is part of a book launch tour for the release of The Vesuvius Isotope, a new book by drug discovery biologist Kristen Elise. This book might be of interest to those of use that enjoy a thriller with a bit of archaeology thrown in :) All the posts on Kristen's blog tour are related in some way to the content of her new novel - see below and be intrigued, maybe you've found your next Summer read! [F]or some of the Egyptians the crocodiles are sacred animals... and each of these two peoples keeps one crocodile selected from the whole number, which has been trained to tameness, and they put hanging ornaments of molten stone and of gold into the ears of these and anklets round the front feet, and they give them food appointed and victims of sacrifices and treat them as well as possible while they live, and after they are dead they bury them in sacred tombs, embalming them. In the winter of 1899/1900, an expedition into the Fayoum Oasis outside of Cairo, Egypt was initiated. The expedition was led by the University of California at Berkeley and the Hearst Foundation. Its goal was to excavate an ancient site: the ancient city of Tebtunis. 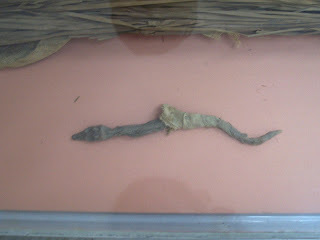 The researchers were looking for human mummies; what they found instead were mummified crocodiles. One of the workers from the expedition was so disgruntled that he took a machete and began hacking at one of the mummified crocodiles. And this was how it was discovered that within some of the crocodiles, an incredibly large collection of papyrus documents had been preserved for two thousand years. 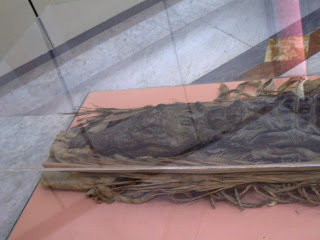 Papyri were found both in the crocodiles, where they were sometimes used as part of the mummification process, and within the city itself. More than 30,000 ancient texts were eventually recovered from Tebtunis, comprising the largest collection of ancient papyri that exists in the United States today. The majority of the texts date to the second century BC, although others hail from the first or second centuries AD. This is the same era that produced the Villa dei Papiri at Herculaneum, offering an Egyptian counterpart to the Roman resource that is still mostly buried beneath the ash from Mount Vesuvius. And, like the texts from the Villa dei Papiri, the ancient papyri of the Tebtunis excavation are still legible to this day. Within the library were more than a dozen fragments of Homer's Odyssey and Iliad. Also found were birth, death, and tax certificates, and petitions to Queen Cleopatra from her subjects. It is unfortunate that no texts have ever been found - either in this database or any other - that were actually written in the hand of Egypt's enigmatic last pharaoh. Also excavated at Tebtunis were several scientific and medical texts, including at least one example of an illustrated treatise on the medicinal properties of plants. Contrasting with these are a number of astrology and magic texts. The juxtaposition between magic and medicine in the same era underscores a critical transition that was underway at that time - the transition from superstition to true science. It is interesting to note that the Tebtunis papyri are written in both Egyptian and Greek - sometimes within a single document. The demotic Egyptian language was common among earlier pharaohs but rarely used in the later years of the first milleneum BC. A gradual replacement of Egyptian with Greek evolved with the Ptolemaic Dynasty, and the Roman conquest of Egypt brought with it an increase in the use of Latin. Cleopatra, the last ruler of the Ptolemaic Dynasty, was the only one to speak all three languages. 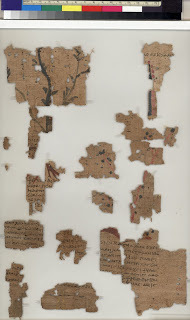 For more information about the Tebtunis Papyri, visit the Center for the Tebtunis Papyri. This blog post explores a non-fictional theme or locale that is incorporated in The Vesuvius Isotope, a novel by Kristen Elise, Ph.D. Order your copy at www.kristenelisephd.com. Egypt is such a beautiful place to spend holidays with your family. I have so many interests to have a trip to Egypt so give me all details. If you really want to take the knowledge about Egypt tourist places then have touch on it.